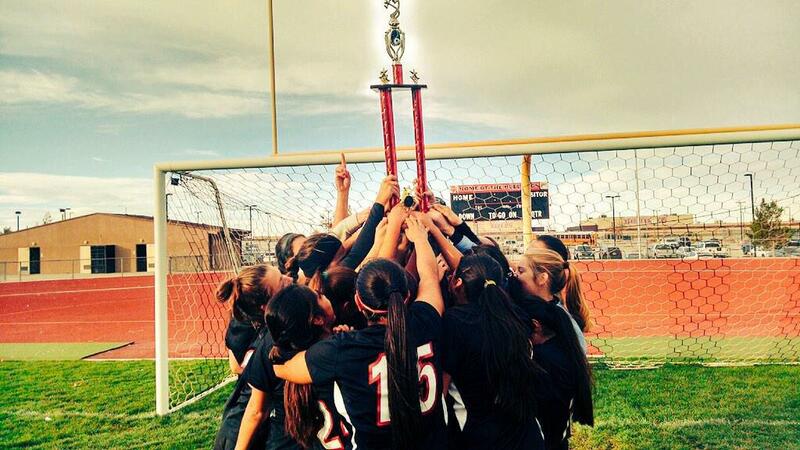 The Etiwanda Eagles hold up the Oak Hills Tournament Championship after defeating Pasadena La Salle, 1-0, on Dec. 20. 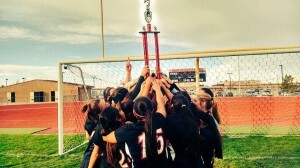 Haley Ruegsegger scored the game-winning goal during the second half for the Etiwanda Eagles in the victory over Pasadena La Salle, 1-0, to win the Oak Hills Tournament on Dec. 20. It was not the only win for the Eagles on the day as they advanced to the title game against La Salle, following a second shutout victory in the morning against the Oak Hills Bulldogs, 2-0, in the semifinals. The Eagles’ Katie Connor and Aleenah Perez were responsible for the goals scored against the Bulldogs. Following the victories in tournament play, the Eagles stand at 11-0 overall with two games remaining before the start of Baseline League play. Despite the record, the Eagles believe they could still improve at this point in the season. As a defensive unit, the Eagles have only given up four goals during the first 11 games of this season. Etiwanda is currently ranked No. 5 in the state and will play at 1 p.m. Dec. 23 against Anaheim Esperanza on the road for its last game prior to the new year.